We’ve all played those games that claim to be completely open. The games that say “If you can see it, you can get to it,” but do those games really deliver 100% of the time? Do you ever find yourself wishing you could experience more? 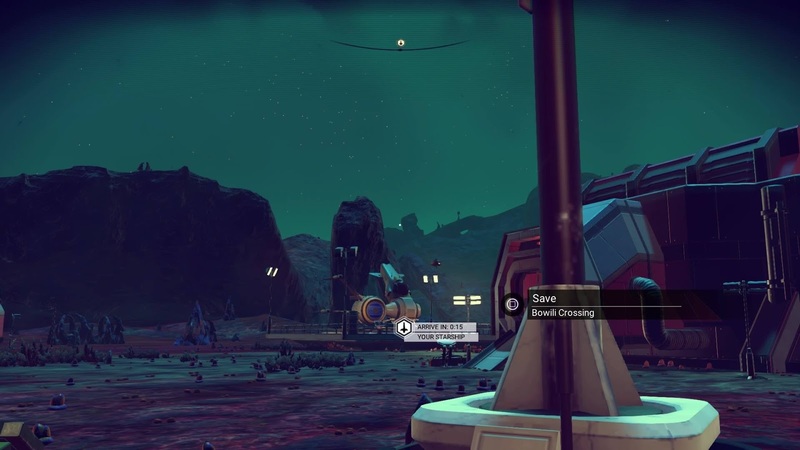 Well, if you’ve been lost in open world limbo, never fear, No Man’s Sky is here! 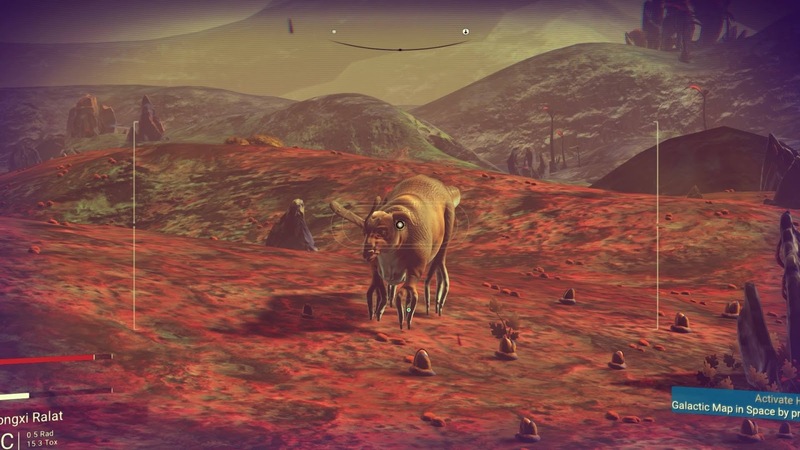 No Man’s Sky is an open world game where the sky is the limit. You start out on a planet with a ship in need of repairs and a multipurpose tool with which you can mine your surroundings for resources. Sounds simple enough, right? Well, here’s the issue: there is no tutorial or explanation of the controls. There are a couple times where the game tells you what you need to do, but for the most part you’re on your own. For example, it took me almost an hour to figure out that I already had the multipurpose tool. I walked around in such confusion, seeing all the resources around me, but with no idea on how to get them. At first I thought maybe I had just missed the notification that told me, but several other players I have spoken to also experienced similar confusion. It took me four hours to figure out there was an option to sprint. And it wasn’t until I’d been playing for several days that I discovered how to open the menu. However, with all that said, the controls and movements feel very fluid. We’ve all played those games where you have to push an intricate combination of keys to accomplish one movement. This is not the case with No Man’s Sky. The controls are simple and feel like an extension of yourself. Your sprint stamina and jetpack bar refuel quickly so exploration doesn’t drag on. Switching between menus and tools is easy to do in and out of combat. Aiming your multipurpose tool is simple and accurate, eliminating those pesky aim sensitivity issues that arise in other games. The second drawback to the start of this game is the lack of storage space. 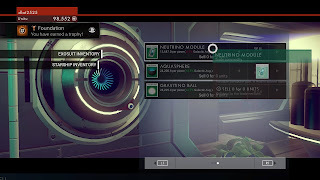 Your pack has only a handful of empty slots, as does your starter ship, which means you really need to plan out what materials you need to make whatever you are working on at the moment. This was extremely difficult for me, since my normal urge is to collect everything within my sights just in case I need it later. However, there are resources everywhere so you don’t have to worry about missing out on something important and then not being able to find more later. The only exception to this rule I can find is Thamium 9, which is what you use to power your ship. However, you only need to keep your eyes peeled for Thamium 9 until you get off your starter planet as you can mine Thamium 9 from the asteroids surrounding the planets as well. If you’re worried about the lack of storage, however, there’s really no need. Along your journey you’ll find blueprints aplenty which allow you to make the most of your items. Also, there are a plethora of friendly aliens willing to help you out. I’d barely started out when I was gifted with a multipurpose tool three times as big as what I started with. I also discovered a ship crash zone which held an expander for my own pack, allowing me to hold several extra slots. 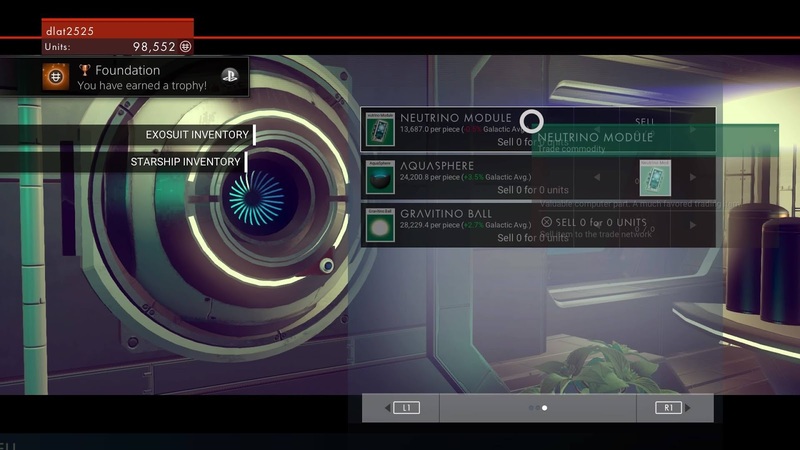 Even without all this, you can instantly transfer items to your ship once your pack is full. 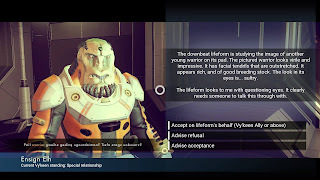 And, if you find your ship’s inventory to be too small for your liking, a new ship can easily be obtained by talking to one of the many traveling merchants you meet along the way – provided you have the funds for it. No Man’s Sky is an amazing game. The two drawbacks I mentioned barely register in light of the rich art style and limitless possibilities that await you around every turn. It is easy to lose all sense of time while exploring. 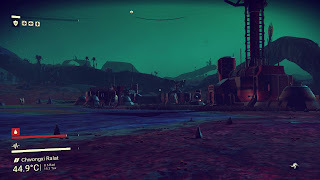 I myself spent four hours roaming around my starter planet before I finally got in my ship and went into space. With every step, your curiosity increases tenfold as you discover caves, rivers, mountains, even entire small ecosystems within the larger zone. The game is set up so that you can focus on whatever you want to get out of it. 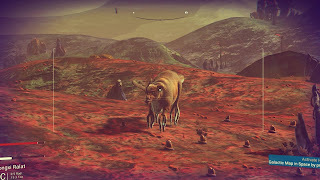 Do you want to discover as many different planets as possible in the hopes that someone sees your name when they land? Or would you rather focus on scanning and identifying all the things that make up a particular planet? Are you looking to become a space pirate with the biggest and baddest ship of all? Or would you rather form a close relationship with the various alien races you encounter? You chose what you want to do and when. This does present one small problem to completionist gamers such as myself, who are reluctant to leave an area until they have located and explored every area and gathered all the resources and items it possesses. This is certainly something you can try, however be prepared to never leave your starter planet. 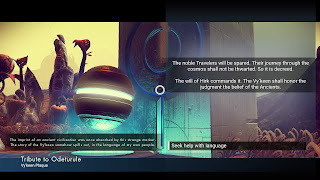 There is just no way to visit everything No Man’s Sky has to offer. However, while I was concerned this would diminish my interest, this is far from the case. It took some adjusting yes, but my overall excitement for the game pushes me to explore and find new planets and areas without feeling I must find everything before moving on. Some days, I spend hours exploring vast cave systems, searching for rare resources to trade for a new ship. Other days, I find myself exploring monoliths and seeking out knowledge stones to increase my status with the Gek. This game eliminates the feeling of having to complete things in a particular order. If you don’t feel like fighting anyone, you don’t have to. You can mine resources until your money bag overflows or you can take out every drone and ship you encounter. It’s all up to you. 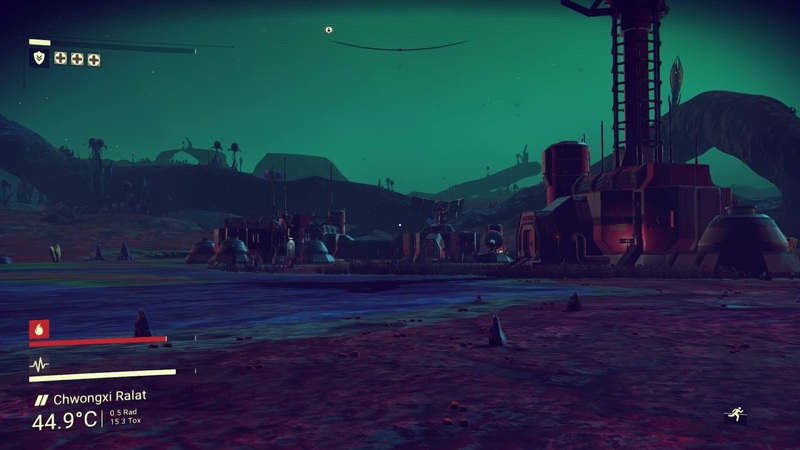 There’s something for everyone to love in the vast expanse of possibilities found in No Man’s Sky. And while some might worry about the lack of multiplayer, let me assure you there is no feeling of loneliness or incompleteness about the game. 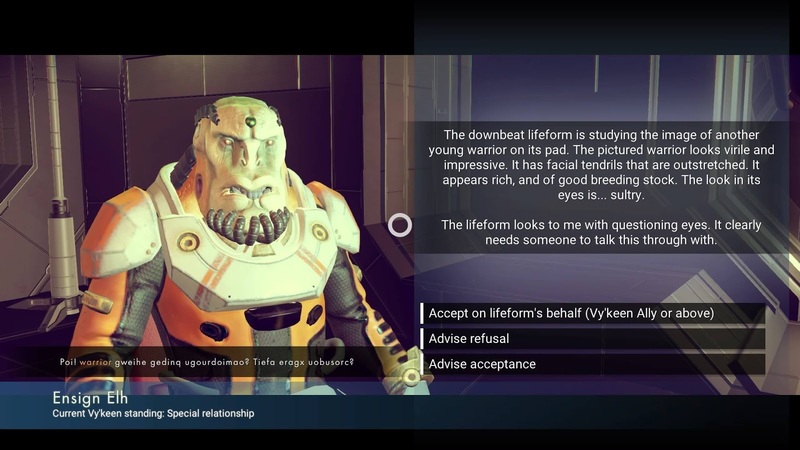 Even if you never meet another player, or even land on a planet which has already been discovered by someone else, there is so much to discover you won’t miss the interaction. Indeed, you probably wouldn’t even notice if you did find an already discovered planet. Chances are there are still infinite places on that planet that still remain to be discovered. 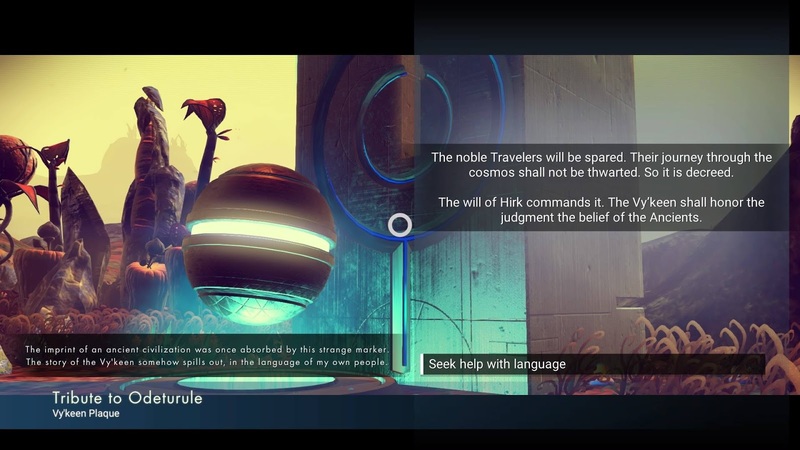 So if you’re looking for a game that delivers on all possible levels, look no further than No Man’s Sky. You won’t be disappointed. Nice! The title killed me-- A+ reference. I was excited for this at first, but it left me with bad impressions at first. It grew on me after a while, but I'd just prefer playing Overwatch. haha. Great post!